Union Lake resident Henry Charles Trent served in the U.S. military and operated Trent’s Prime Rib Beef Market in Detroit prior to opening Menjo’s in Detroit with Mike Crawford and Joe LaRosa. Trent also owned the Prudential Health Club in Detroit. A suburban housewife and mother, Virginia Dolores Szymanski inherited the Royal Show Bar from her step-father in the early 1960s. While she owned and operated the Detroit bar, it became a popular gathering place for black sissies, black gay men, and black drag queens. Born in Detroit, William John Cornell attended Wayne University and, as one of city’s premier theatrical press agents in the 1950s, represented various stars when they visited the Motor City, including Ethel Merman and Marlena Dietrich. Cornell and his partner Peter Prass were killed when a fire gutted their Chicago Boulevard apartment. Born in Royston, Georgia, Sally Mae McCoy moved to Detroit following World War II and attended Fleming Beauty School in the 1950s. In addition to teaching cosmetology and operating a hair care business, she worked for 20 years as a custodian with the Detroit Public Schools. Rev. Renee McCoy was among her five children. Dolore “Del” Thusius earned his Bachelor’s in music from Valaraiso University and his Master’s in education from Western Michigan University. Thusius taught choir at Portage Central High School from 1955 to 1983 and directed annual musicals. He shared a home in Kalamazoo with his partner of 48 years David Reichard. From 1976 to 2014, Dearborn Heights neurosurgeon Dr. Henry Messer was a tireless advocate for gay rights in Michigan, active in the Association for Suburban People and the Michigan Organization for Human Rights. In 1991, Messer played an instrumental role in establishing the Triangle Foundation, which later became Equality Michigan. 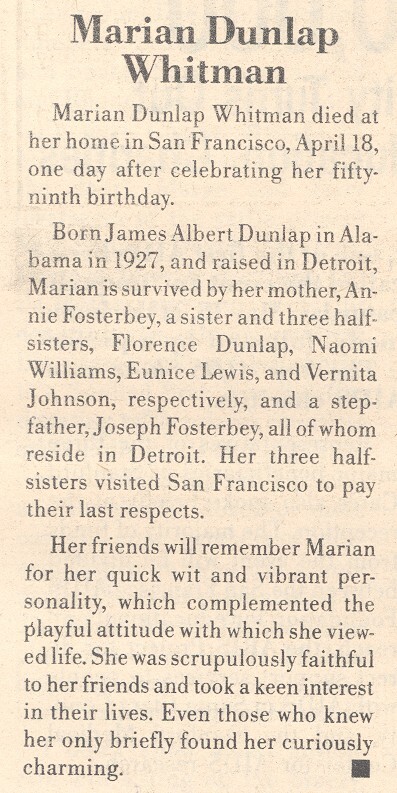 Raised as James Dunlap, Marion Dunlap Whitman worked as a sewing machine operator in the late 1950s and was one of numerous crossing-dressing African-American Detroiters entrapped on the streets by undercover vice. After serving 18 months in the State Prison of Southern Michigan, she moved to San Francisco.